As part of our celebration of the tercentenary of Capability Brown, and his contribution to the development of the English countryside in general and Highclere Park in particular, we are organising a Press Day here at the Castle. This will take place on May 12th and we are working in collaboration with Visit Britain as well with some of our own press contacts. Lancelot “Capability” Brown was born 300 years ago and during his life transformed many of the more formal English gardens and parks into an Arcadian world of expansive lawns and lakes framed by artfully grouped trees. It was about scale and grandeur as well as beauty. 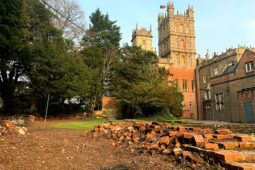 During our event we are aiming to explore the transformation of the landscape at Highclere and relate it to other houses and “Capability” Brown parks. Highclere Park is quite large so I thought it would be sensible to hire a mini bus for those journalists wanting to see some of the key scenic views. The Highclere team began to discuss the details of the day and, a little nervously, the route that the bus might take. I say a little nervously because of the events of a couple of years ago. On that occasion we had hired two buses to take some guests round to see various follies. I was on the first one and my husband was on the second. On my bus I was facing the back simultaneously lecturing whilst giving directions to the driver and thus, perhaps inevitably, left and right got muddled and my bus went the wrong way. My husband, somewhat bemused, ignored us and his bus carried on to return to the Castle. Realising my mistake, I stopped my bus and suggested we back up. Unfortunately, whilst doing so, the driver reversed over a triangle of grass and the bus got stuck – quite badly. I radioed the Castle saying we might need a farm tractor. Meanwhile I suggested that everyone got off and pushed. This may have been a slightly surprising turn of events for the guests, some of whom were not wholly suitably dressed for such activities, but everyone gamely did so. The bus was now much lighter and lo and behold, we got it off the grass. We clambered back onto the bus to continue our unexpectedly interactive bus tour. My husband stood crossly waiting for me in front of the Castle and said “I don’t believe it!” I was laughing so much I could not answer but all our guests took it in good spirits. Unanimously, I am apparently not giving directions this time. Capability Brown drew up three plans for Highclere in 1770. We still have one and I have written a short booklet about his life and Highclere, focusing on the map here before Brown, his map and the map after Brown. These particular maps mark forty years in the development of Highclere’s Park and I have found the project fascinating. However, the story is not just about Brown but also about the energy and vision of the 1st Earl of Carnarvon who rode and observed with such care the land he had inherited. Therefore like many of the commissioned landscapes, Highclere was a partnership between “Capability” Brown and his client. “where he is the happiest man he will be least remembered, so closely did he copy nature his works will be mistaken’. Today, the Park looks utterly natural: a marvellous accolade to a great man. Such a wonderful post about Capability. I loved the park when I visited in April. My friend and I debated over which tree it was that The Dowager Countess (Maggie Smith) is pictured under. I have a picture of myself under the tree we think it was. Downton used our Secret Garden as a sub for Maggie Smith’s Dower House – and the cedar tree under which Capability Brown sit was use for by Matthew and Mary…if that is any help. I tis in fact a wonderful tree with amazing views through two valleys towards the south. The sun was out today and it is such a world apart. love of Highclere with us. We will see what happens next week with the journalists…. The people who got stuck were part of an association simply having an (unforgettable) visit. They were honestly just brilliant and pushing the coach out was such an achievement. Wonderful pictures and kudos to Capability Brown! He certainly did live up to his name. The sheer natural beauty surrounding Highclere looks incredible.The anecdote about losing your direction was really droll, although I believe Lord Carnarvon probably would have not thought so. Lady Carnarvon, you are a raconteur par excellence and your narration style is wonderfully captivating. I eagerly await an opportunity to visit England and spend a wonderful day at such a lovely place!!! I think like all things in life, it is the detail. 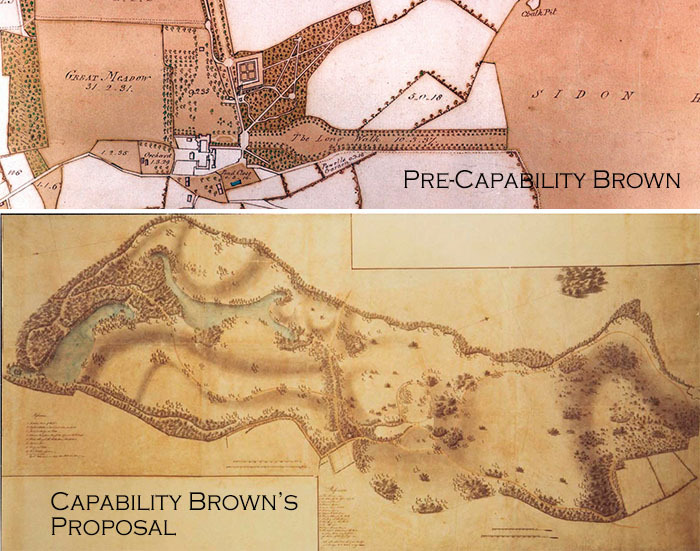 Capability Brown never ignored the detail, the planning and preparation. That photo of the sheep grazing is spectacular. What a wonderful idea to celebrate the work of the man who carved out this picturesque place. We never really consider such things as tree placement, but it certainly makes sense. Your narration does him great honor. It’s always such a delight to take a few moments to enjoy your blog. So now we can add another job to your title (Tour Guide). The “pre Capability” map does not show a water feature. Was this added as a part of the proposal or did it already exist? Beautiful story. And to think that this mindset was around about 200 years before we started to think about “parks” in the USA. I have done quite a bit or research about Frederick Law Olmsted who designed Central Park, New York, amongst other parks and was a great admirer of Capability Brown. Naturally I am trying to place him at Highclere en passant. I am preparing a book following the one I most deliver in the next 2/3 months and that is where I pursue parks such as Central Park. I so enjoy your reflections on the past and the role each part has played in what we now see at Highclere. As a former resident of New York City, I appreciate in a similar way the vision of Frederick Law Olmsted and his transformation of Central Park (and many other parks and estates). Your blog captures so many wonderful and entertaining aspects of life in, and around, the Castle! I hope to visit again – there is always something new to see, understand, and enjoy! Thank you! Exactly, as my comment above! Lady Carnarvon, your stories always make me smile. Thanks for the smile this morning… I would willingly help push a bus out of a ditch to have you as the tour guide! 😉 Have a wonderful weekend. Excellent – thank you it was hilarious and all’s well that ends well..
Lady Carnarvon, I met you at a luncheon in Omaha, Nebraska USA. I am a Landscape Architect and you promptly informed me of your planned events celebrating Capability Brown. I am elated to say that we will be visiting Highclere and your celebration in a couple weeks…. In advance, a hearty thank you! Best regards, Richard. Lady Carnavon, I LOVE your posts! You have such a way with words! I certainly would have helped push that bus! What a great story! Good luck on your day honoring Capability Brown. I think that’s a lovely idea. Dear Lady Carnarvon, thanks again for yet another wonderful blog, I did laugh reading about your escapade with the coach. The gardens look wonderful too. Have a great weekend and enjoy this wonderful weather. 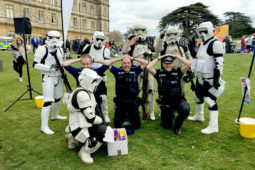 It has been a wonderful sunny day here and we have been raising money for Starlight today – the same as Make a Wish in the USA. We have had some really generous people here and the charity has had a great day. We are lucky. Oh my word, I laughed so hard!!! I loved this post; as I do all of them. Have the rains stopped and the ducks moved on to wetter pastures?! I know it’ll be a lovely day on the 12th – can’t wait to hear about it. All the Castle team still start laughing whenever “buses” for a tour with me on board are mentioned. We have some park-like acreage and it has been our passion the last 20 years developing the beauty of the terrain hidden amongst the overgrown brush. My husband has a unique talent for showcasing the lay of the land with gardens and walking paths. Every year my passion is to add new plants/trees/bushes and rearrange the old. Spring is the most fun whilst the heat of summer gives way to afternoons in the pool basking in our surroundings. How did Mr. Brown come to be known as “Capability”. Are you aware of our beloved American actress Lucille Ball and her husband Desi Arnaz? The “I Love Lucy” show? I can imagine them in the same scenario as the bus tour. You know how they say “the best laid plans of mice and men”. 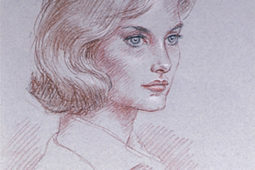 You are such a delight and we are so privileged to stroll with you among the landscape of Highclere – inside and out. God bless you and all your endeavors. He was born Lancelot Brown, but he was very hardworking with tremendous attention to detail. Some of the lakes and dams reflect his knowledge of engineering. He also reputedly told his clients that their parks had great “capabilities”. He was a successful businessman and a welcome dinner guest! When you write, I feel as thou transfixed, I am there (although possibly on the other ‘bus’,). ‘Capability’ Brown was a visionary, and you are still guardians of the inheritance, so together you have done a marvelous job keeping both the grounds and the castle Highclere in superb condition. It takes so much work to keep these things up, and we all thank you for what you are doing. What a marvelous tribute. I hope to come see all this splendor one day. 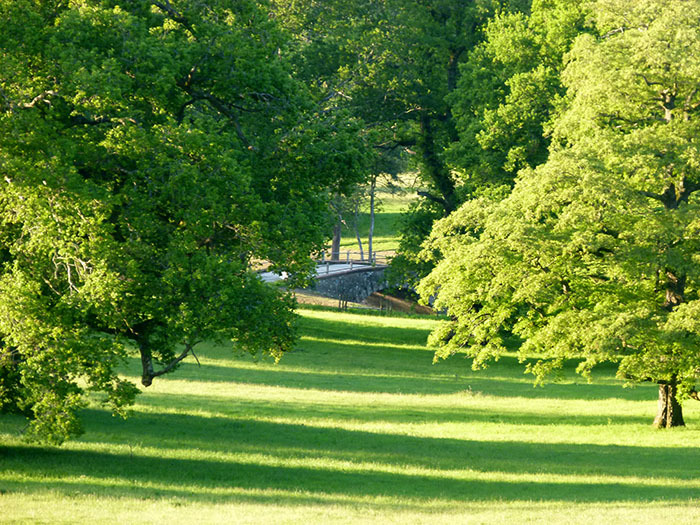 True beauty is not contrived and this Park looks so natural. Thanks for a peek into the Park’s past and present. We have a lot of rain in New York City recently but your gardens and surroundings are very much more lush than our in USA. Thank you for all the information on your lovely surroundings . Hopefull Soon shall be back in UK , love your country ! How do I get on your “Press Day” invitation list. Was there last August and wrote a piece with pictures for my online newspaper column “SKYGIRL,” and everyone is clamoring for more. Short notice, but think I could swing it by Thursday. Thank you so much for the tour yesterday of the beautiful grounds and of Highclere Castle. Seeing it up close so to speak and personal, gives one an appreciation that Capability Brown had a gift beyond being a visionary. Hard to describe and I wish he could see it now, to see the love and care it receives. I would also like to say thank you to you and Lord Carnarvon for your wonderful relaxed introduction to Capability Brown, his work and the history of the castle. Yes – “capabilities”! We have a new neighbor who has a spread three times the size of ours. She is new to such broad agricultural space and we are delighted to be the ones to share our knowledge and show her the “capabilities” she has in her yet unrefined realm. Such fun!! We very much enjoyed visiting the castle and the garden tour today but have some constructive feedback for you and the team behind Highclere. As I would classify Highclere Castle to be 100% British I was amazed to get mineral water that was bottled in Turkey (!) and instead of the really lovely scones which one can get at almost all National Trust places (we are NT members) I was very disappointed when a cupcake was presented to us as part of the same lunch pack. In addition I would kindly ask your tour guides to have more coordination of the told storyboard as we were told inside the castle to look out for the three Scottish pine trees when out in the garden but unfortunately your garden guide did not know anything about them. Finally, it would have been nice to hear a bit more about Capability Brown at Highclere during the garden tour. I think his name was only really mentioned right at the start which is a bit disappointing as the tour should have been a special one designated to Capability Brown. All in all we very much enjoyed visiting Highclere and can definitely recommend this to friends. I always enjoy reading your blog. I came to your talk on the Thursday of Capability Brown week. A question was asked about how you use the sheep’s wool from the estate. You expressed sorrow that you couldn’t find a use for the wool. At a recent visit to Chelsea Flower Show we came across a stand for Dalefoot Composts who use sheep’s wool in their wool compost. Have you heard of them?A solution perhaps?